For two years photographer Chris Leskovsek has been roaming the streets of Auckland, capturing intriguing black-and-white images as a way of acquainting himself with the town he now calls home. The Chilean-born artist moved to New Zealand to continue his graphic design and illustration career but found himself gravitating to the camera as a means of expression and discovery in a new land, giving rise to a series of self-published photo zines called Øbservations. After publishing six excellent issues of Øbservations Chris now brings the project to culmination with a public exhibition of black-and-white prints displayed at Auckland’s Camera and Camera store. The photographer chats to D-Photo about bringing Øbservations to life, from the streets to page to print. 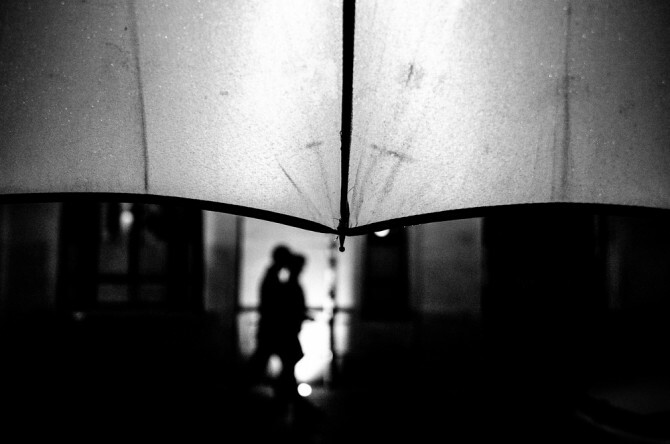 D-Photo: How did you come to street photography as a genre that interested you? Chris Leskovsek: When I came to New Zealand things didn’t go as planned, specially the first year, which meant that I was doing long walks around the city; wandering, thinking, observing. I then started bringing my camera and started taking pictures of this new place so different to my home. Everything is different. I wanted to fit in somehow, but not really. A long time passed before I started researching about photographers. Cartier-Bresson was always there, and that comes because I am very into surrealism in my graphic arts and Cartier-Bresson was named in few books and such. Then I started reading about all this French photographers, yet my “a-ha!” moment came when my boss at the time came to me one day and saw me working on my photos while at work and said, “Oh that’s cool, it reminds me of Moriyama”. I turned around and said “Mori…who?”… The rest is kinda history. I guess street photography is a term that describes just part of what I like to do. Usually I take photos on the streets, when I’m not travelling or taking road trips with the family. I much prefer the simple term documentary or personal documentary photography. When you first started Øbservations what were you setting out to achieve? And did that focus or goal change as you progressed? I never really planned the Øbservations series. What happened was, as everybody else, I start sharing work over the sea of the internet. Every now and then I would get a comment or a ‘like’. Then I started getting more comments and likes, but only on certain photos, not all of them. That’s when I realized I like telling stories, or shooting series of photographs rather than single ones. Also, as a graphic designer print is always my go-to medium for pretty much everything. For me, things need to come out of the screen into real life. So photo books was the way to go. Then I realized the costs into making one, especially here in New Zealand. So in a nutshell, Øbservations started as a way of showcasing my photos about this new place I now call home, while at the same time spreading my work. I also needed a simple, non-pretentious name for these photos. And because this was never thought through from the beginning I treated the whole series like journals, so I could have freedom as to what goes into them. I love photo zines as a medium – why did you decide to go that route for Øbservations? Well, I guess it was the concept behind zines (and the cost, of course). I’ve always loved D.I.Y.-ness. Plus it was the only ‘serious way of putting my work out there. What's your general approach to street photography – an unnoticed, invisible presence, or conspicuous and connecting with people? To be honest, I don’t mind. I shoot what gets my attention, I like connecting with people and being invisible. Sometimes my photos don’t have people in them. It has a lot to do with the mood, the light and, of course, what I want to say with it. Photography for me is personal. Do you have any self-imposed rules or limits to what you'll shoot in public? No specific rules. There are things I try to avoid though, such as homeless people. Regarding privacy, it is hard to be private in the world of Google and governments spying on everyone’s each and every move. Even harder in the world of cell phones and Instagram, with people shooting everything they do. But, yes, I don’t like jumping in peoples’ faces. If I see an interesting character I would happily ask to take their portrait. Otherwise I keep a bit of a distance and shoot quietly. When you head out with your camera are you exploring with a sense of the kind of shots you're after, or is more of a drifting exercise in waiting/hoping for elements to come together? I used to go out and shoot whatever. I still do, but now I see myself clicking less and less. After Øbservations I’ve seen myself moving more and more into specific projects and such. But it’s hard. I try to shoot every day. I love wandering, that’s how I get to know the places I visit. What I like about going out to shoot is that I can’t control what’s gonna happen. It’s like fishing. Sometimes you catch a lot of fish, sometimes you come home empty handed. But it’s not under your control. It’s a meditative process. And it involves a lot of luck. You're Chilean-born and have now explored and experienced Auckland very thoroughly, as someone with an international perspective how would you characterise the city? Tough question. The weather is terrible; I just hate the whole ‘four seasons in a day’ thing. Auckland for me is different. Not good or bad different. Just different. I think of it as a ‘big village’. I mean, everyone seems to know each other, and it’s not hard to see the same faces around the city every now and then. It’s big but small at the same time. Aucklanders seem very private and closed. Very indoors-y. I come from a country that has a strong outside life. I don’t mean outdoor as per sports, which kiwis are brilliant at. But I mean more in the sense of taking to the streets to party, to be loud, to be more open to each other, not so reserved and such. Live the streets. What's in your kit when you're out on the streets shooting? I prefer compact cameras. Usually a Ricoh GR or an OMD with a 20mm pancake for my everyday shooting and a Sony A7 with a 35mm and 50mm lens for travelling and weekend road trips. The Øbservations exhibition is curated by Nick Khoey – is it difficult to let someone else make the selections on such a personal project? Yes and no. Yes because, as you said, it is very personal. But no, because I’ve lived with these photos for more than a year now, and it’s always good to get an ‘outsider’ to see thing you otherwise overlook. But we are both happy with the final edit. What do you hope people take away from viewing the Øbservations exhibition? A different point of view of Auckland. Usually Auckland and New Zealand in general presented from a very touristy point of view, and even locals shoot a lot of landscapes and sunsets (which is absolutely fine, it´s hard not to surrender to Auckland´s beauty on a shiny day). But I believe there’s a lot more to Auckland than that. I want to see that ‘real’ face of the city, to experience and document my life in the daily routine. I recently had this project compared to Gary Baigent’s The Unseen City (1967), which I had been totally unaware of until that moment, and I was blown away, not to mention honoured, for such huge comparison. I wish and hope someone will pick a copy of Øbservations 40 years from now and look back at it to see a different ‘face’ of the city. What city is at the top of your street photography bucket list? Uhhh, tough one. I’m not necessarily interested in cities per se, more into visiting countries and different cultures. I guess a big challenge for me is hopefully go back to Santiago one day and be able to see it as an outsider and document it with fresh eyes and maybe do something like Øbservations there. I’m usually attracted to ‘un-explored´ places. I mean, Tokyo, New York, Paris have been done to death, and I have nothing against that. In fact I’m finally going to Japan in April and I very much intend to shoot over there obviously. But I would really like to make more projects and photo books related to Latin America. In the meantime I have a lot of stuff to do here in New Zealand.